That moment you first set eyes on Petra. Flight time 5 HRS FROM LONDON. 11 HRS FROM NYC. Shrouded in mystery, where ancient civilizations lay hidden in the depths of wadis, the Middle East is a place ripe for discovery. 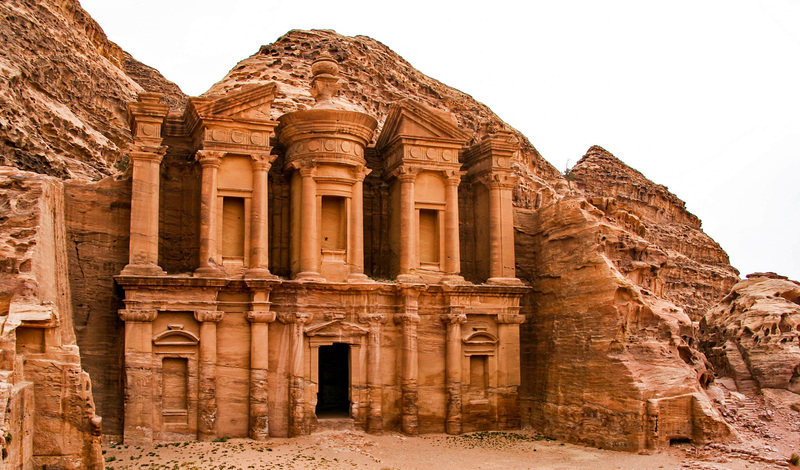 On this 12-night trip through Jordan and Oman, we’ll take you crashing over the sand dunes of Wahiba Sands and wading into the Dead Sea to unveil ancient wonders and modern innovations. Contrast the electric atmosphere that surrounds a picnic in Petra with the peace that reigns over the Omani Grand Mosque and the simplicity of a night in a Bedouin luxury camp with the rustic luxury of a mountaintop retreat – and you’re just about beginning to scratch the surface. Enchanting and magnetic, unlock the magic of Arabia. Your trip begins in the Jordanian capital of Amman with two nights at Fairmont Amman. Tucked between affluent city streets and the buzz of downtown, it’s the perfect springboard into this ancient city. Rested from your travels, we’ll take you out to Jerash where you’ll step through Hadrian’s Arch to discover the best preserved Roman city in the world outside of Italy. It sets the perfect tone for your next stop walking the city walls of Amman’s ancient Citadel, perched atop the hill of Jebel al-Qala’a, where you’ll discover the intricate Temple of Hercules and the faded grandeur of the Ummayad Palace before leaving the city behind for the desert. Passing by the fabled foothills of Mount Nebo, where Moses was first said to have laid eyes on the Promised Land, you’ll discover it in Wadi Musa at the gates to Petra. Just outside, check in at Movenpick where you’ll have front-row views to the Great Rift Valley and be first through the gates in the morning. Whilst a palpable buzz hangs on the air outside Petra, step through and allow the jaw-dropped silence to engulf you. A place that defies imagination, words and photos; it is one that you have to experience for yourself. Veiled in mystery, we’ll send you in with an expert guide to separate fact from fiction and link you up with a local family for an unforgettable lunch at their home overlooking the city. Driving back to Amman, you’ll stop off for a few hours on the shores of the Dead Sea. Wade in, lie back and experience the sensation of being utterly weightless before catching an evening flight to Muscat. Spend the morning strolling around the Omani capital of Muscat’s architectural masterpieces. Starting at the Royal Opera House, discover a fusion of Omani tradition and heritage with slick modernity before venturing into the Grand Mosque where a quick glance to the domed ceiling of the main prayer room will reveal an intricacy like no other. From Muscat, you’ll then head up to the Nizwa mountains where you’ll spend the next few days with your head quite literally in the clouds 10,000ft above the desert floor. A scenic drive awaits, but nothing can quite prepare you for the speechless beauty of your hotel. Ruggedly luxurious, Alila Jabal Akhdar will open your eyes onto the beauty of Oman – quite literally too with views of the mountains lying at the foot of your bed. Get out and explore them tomorrow on a private hiking tour where you’ll spend some time with a local Bedouin before traversing the mountains, past crimson rose terraces and abandoned villages, to find yourself on top of it all. After three nights at Alila, the scenery will take a softer turn as you head onto the vast mass of undulating red and white sand dunes that make up Wahiba Sands. Crashing across the dunes, with the sun causing the colors to dance before you and the wind whipping up puffs and whirls; it’s a photographer’s dream. So too is your home for the night at a luxurious desert camp. A million miles from city life, you’ll spend tonight beneath canvas in a lantern-lit Bedouin tent with dinner served up beneath the stars. Spend the morning spiking your adrenaline with a spot of dune bashing before taking a desert dip at Wadi Bani Khalid where the village lies hidden in the mountain and the wadi waters run clear and blue. 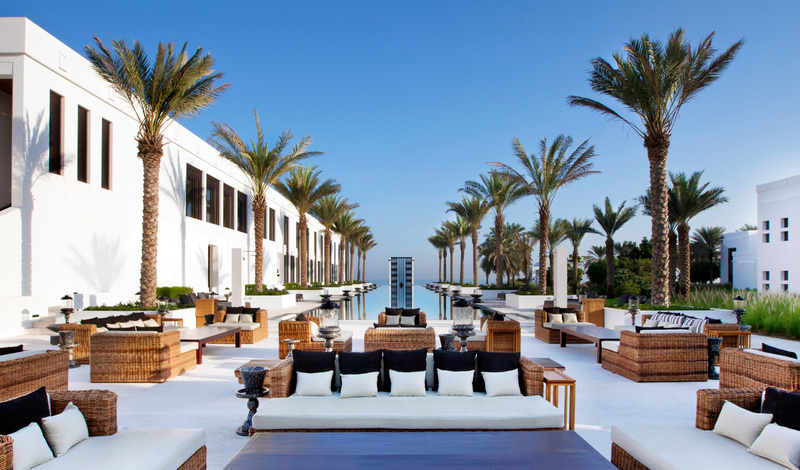 Before returning home, spend a few days in total luxury at The Chedi Muscat. Easily one of our favorite hotels in the world, it’s chic minimalist bliss sitting beneath a rugged mountainscape and running out to crystalline waters. Whether reclined by the seemingly endless pool or strolling the beach, this is the perfect place to end your cultural escape. For one last outing though, we’ll organize for you to head out into the Gulf of Oman in search of the whales and dolphins that call this a playground before whisking you into a quiet bay of Bander Al Khayren for a swim and a snorkel. After two days of taking it easy, it’s time to bid farewell to the cultural riches of the Middle East and return home.